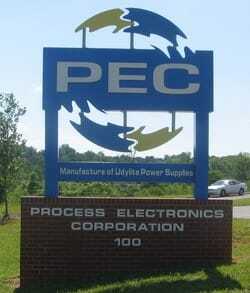 Process Electronics Corporation (PEC) was formed September 12, 1984, in Roseville, Michigan. At the time, PEC was a subsidiary of OMI International Corporation. OMI was headquartered in Warren, Michigan. OMI adapted its name when George B. Berry purchased Oxy Metal Industrial Corporation in October 1983. This Corporation, one of the major chemical producers in the U.S., was best known for its biggest unit, Udylite, an important part of the Detroit area industrial economy for many years. Udylite was founded in 1919 in Kokomo, Indiana by Marvin J. Udy, who developed a method of electrode deposition of cadmium on metal. In 1927, the Company moved to Detroit. Over the years, Udylite developed many new electroplating processes. Process Electronics Corporation and OMI International Corporation were granted exclusive United States sales, marketing and manufacturing rights for the full line of UDYLITE DC power supplies and process controls. OMI International Corporation was sold and divided in 1988. Mr. George Berry relocated Process Electronics Corporation to Gastonia, North Carolina. The relocation was done to consolidate facilities for improved efficiency and support of product lines and markets served. PEC remained committed to continuing to build the already strong Udylite brand, products, reputation and reliability. Process Electronics Corporation, now located in Mt. Holly, North Carolina, continues to strive to make its predecessors proud. No product leaves the building without thorough inspection and the "stamp of approval" of Quality Control. Many remember George B. Berry, as a truly remarkable man. His untimely death in 1996 was a shock to many. His wife, Carolyn, continues to oversee PEC. Our mission at Process Electronics Corporation is to design and manufacture the most reliable, innovative, durable and consistent Power Supplies, so that our customers can be the most successful manufacturing and metal finishing facilities in the world.